What a night for the 20 plus year Rainforest Foundation: Trudie Styler produced her biennial all-star fundraiser at Carnegie Hall, probably the best ever with Sting, Elton John, James Taylor, Jennifer Hudson, Roseanne Cash, Esperanza Spaulding, Vince Gill, Bruno Mars, opera great Bryn Terfel, Rita Wilson, Meryl Streep, and Channing Tatum with his gorgeous dancer wife Jenna, and special guest Bill Clinton. They raised millions more for the preservation of the Rainforest and its indigenous people. So many highlights but probably no one will ever forget Elton John singing 'Diamonds Are a Girl’s Best Friend' while Channing Tatum, wearing a vest and no shirt underneath, plus a black bowler, danced around him as if he were in the show, 'Chicago'. It was hilarious. Jennifer Hudson, of course, blew the doors off the building singing 'And I’m Telling You' from 'Dreamgirls'. It wasn’t so easy: sitting front and center were none other than Clive Davis and Aretha Franklin. Tom Hanks sat above everyone in a theater box, watching wife Rita belt out tunes. It turns she is a mighty fine singer; her album comes out in May from Decca. Tom was beaming, Later, at dinner at the Pierre Hotel, some paid $26,000 at auction for Hanks to record their voice mail messages. Styler, who directed the show, spoke urgently and passionately about the needs of the people of the rainforest. The other key speaker was Bill Clinton, who can motivate any crowd. He told me that Hillary could be in the White House in 2016. ''I’m getting in trouble this week,'' he laughed. Clinton stayed at the Pierre a long time, talked to everyone, and signed everything. He’s a charmer, that’s for sure. 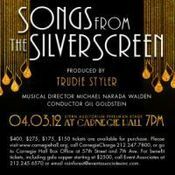 But back to the show, called ''Songs of the Silver Screen''. Sting had a surprise hit with the dark theme from MASH, called 'Suicide is Painless'. Steep was a standout on 'When You Wish Upon A Star' and the two performed a duet of 'Let’s Call the Whole Thing Off'. During the intermission, Clinton told Trudie and Sting how much he loved Roseanne Cash's version of 'Ode t Billie Joe'. ''That song was a big deal when it was released,'' he recalled. The hits just kept on coming all night, with each artist spot-on. You know that every two years Styler picks these people because their live performance skills are so exact. James Taylor’s voice soared the hall on 'Shall We Dance', and he twirled Rita Wilson around the stage. When Elton John sang 'Rock Around the Clock' and Bruno Mars did 'Heartbreak Hotel', the whole cast - from Sting to Streep to the dancing Tatums - did the Twist. The staging worked because all the performers sat in director’s chairs on stage through the three hour show.